For this edition of Friday Fun, I am going to share a fabulous book that I just finished, Finding Me by Kathryn Cushman.Kelli had lived her entire life thinking she knew who she was and her family. However, as she begins to clean out her father’s office after his death, she realizes it was a lie. Staring at the facts in photos and newspaper articles, she must decide whether to ignore it or travel across the country to discover who she really is. Kelli faces many obstacles along the way as she returns to her hometown and befriends her mother and sister. As she grows closer to them, Kelli is faced with the decision of whether to reveal the secret that could nearly destroy them. 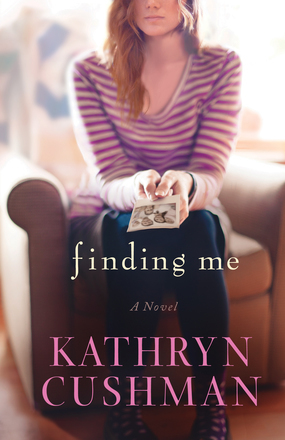 Kathryn’s characters come alive in Finding Me. Being the first book of hers I didn’t really know what to expect. I was blown away by the dimensional characters with real problems and raw emotions. Kathryn takes the reader along on the journey with Kelli. It is a book I would highly recommend. Don’t miss out on this incredible story, pick up your copy today. Now, it is your turn, I want to hear what you have been reading. Share the title of the book you read last.